About 100 cane harvesters who were transferred to the Albion Estate after the closure of the Rose Hall Estate yesterday protested for severance payment over the conditions they are facing at the estate. After the closure of the Rose Hall Estate some 350 cane harvesters including planters were transferred to the Albion Estate. Stabroek News was told that as of yesterday all 350 workers were on strike. Although the strike began on Tuesday, the transferred workers, in an effort to further highlight their issues, took to the streets for two days now protesting for officials to intervene. 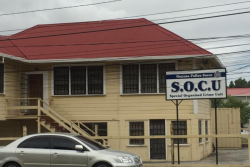 However, while GuySuCo yesterday called the strike an illegal one, the workers told Stabroek News that they want to plead their case to officials who they are hoping will understand their frustration. Adding to this, the corporation has given the workers an ultimatum that if they do not turn out to work before tomorrow then action will be taken against them. “The Corporation is a commercial business and wishes to inform all those employees on strike that they are expected to report for duty latest by Saturday April 6, 2019.”….